Talk about kitchen chemistry! Agnes Pockels was never formally trained as a scientist, but she turned dishwashing observations into influential scientific discoveries about surface tension, inventing a widely adopted measuring device called the Pockels trough. Agnes Pockels was born in Venice in 1862. She had a passion for science, especially physics, and wanted to learn more than the all-girls school she attended as a child provided. Unfortunately, at that time, women weren’t allowed into universities, so she had to learn vicariously through her younger brother, Friedrich. 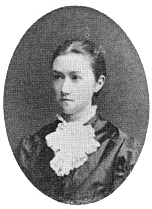 Friedrich went to study physics at the University of Göttingen and sent her letters and books. This allowed Agnes to gain a deep understanding of the theory of advanced physics, but she didn’t have access to traditional scientific equipment to do official experiments like the ones she was reading about. She never married nor had children, but she still had a lot of housework to do. Looking after her ageing parents involved a lot of dish washing, and she started to test how different soaps and oils affected the surface tension and other properties of water. To help her quantify differences, she created an apparatus that came to be called the Pockels trough, which enabled her to measure surface tension. Over a couple years, she continued to optimize it and one day she received a letter from Friedrich describing a publication by Lord Rayleigh describing experiments of oil layers on water surfaces. Agnes sent Rayleigh a letter with the results of her experiments. Rayleigh was so impressed he sent the letter to the journal Nature, asking it to be published alongside an article of his (giving her credit). They agreed and Agnes, with no formal scientific training, became a published scientist. She went on to publish several more papers but the declining health of her parents and the First World War made continued research difficult. Other scientists adapted the Pockels trough for their own work studying surface tension, including Nobel Prize winner Irving Langmuir. Although she didn’t win a Nobel of her own, she did become the first woman to win the German Colloid Society’s Laura R. Leonard Prize (in 1931). And in 1932 the Technical University of Braunschweig presented her with an honorary doctorate.